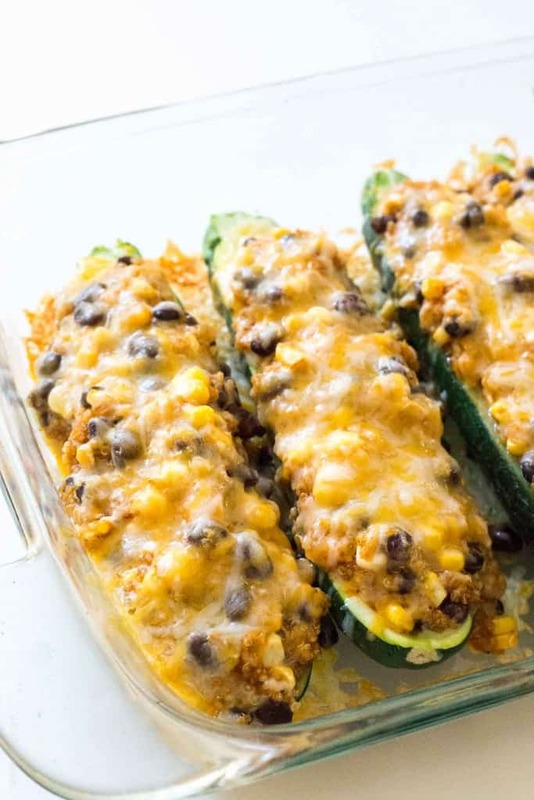 A healthy and easy Quinoa & Black Bean Enchilada Stuffed Zucchini boat recipe with fresh corn and topped with melted cheese. Delicious and full of flavor, yet lighter on carbs and calories than a regular enchilada. My girlfriend just had her baby, and he is the cutest darn thing I have ever seen. This girlfriend is the first of my close friends to have a baby, and she has been a LIFESAVER to me throughout my pregnancy. She was already 6 months pregnant when I found out I was 1 month pregnant, and she was one of the first people I told. Having her a few months ahead of me has been the greatest resource. I text her with questions all the time. AND she’s a nurse! So she can answer my “is this normal” pregnancy questions, and she helps me decipher my lab results. I don’t know what I would do without her. I just love her. As soon as her son was born, I went to go visit her and take some newborn photos of him. We had him set up on the bed, and as I was snapping pictures he started smiling in his sleep! I could barely contain my excitement. Isn’t he just perfect? I melted from cuteness. Can’t believe I caught one of his first smiles! Along with taking her newborn photos, I came bearing delicious, home cooked food. I made her a big freezer batch of lactation cookies (still perfecting the recipe, but will be coming soon!) 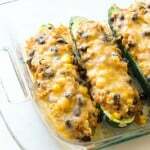 and these quinoa & black bean enchilada stuffed zucchini’s. I actually had a hard time trying to decide what to bring her for food. 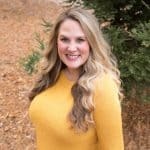 I wanted to bring her something that she could easily reheat or pop in the oven, but all the typical “reheat” meals seem to be casseroles loaded with carbs and cheese, or hot soups. The last thing I want to bring a mom of a July newborn is soup. It was almost 100 degrees the day I went to visit, definitely not soup weather. And a rice or pasta casserole just wouldn’t have enough healthy vegetables that a nursing momma needs. 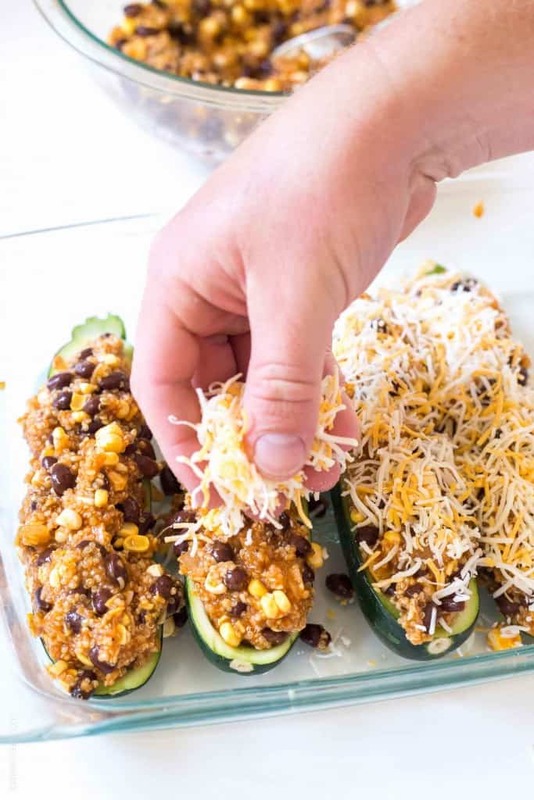 These quinoa & black bean enchilada stuffed zucchinis turned out to be the perfect make a ahead meal. 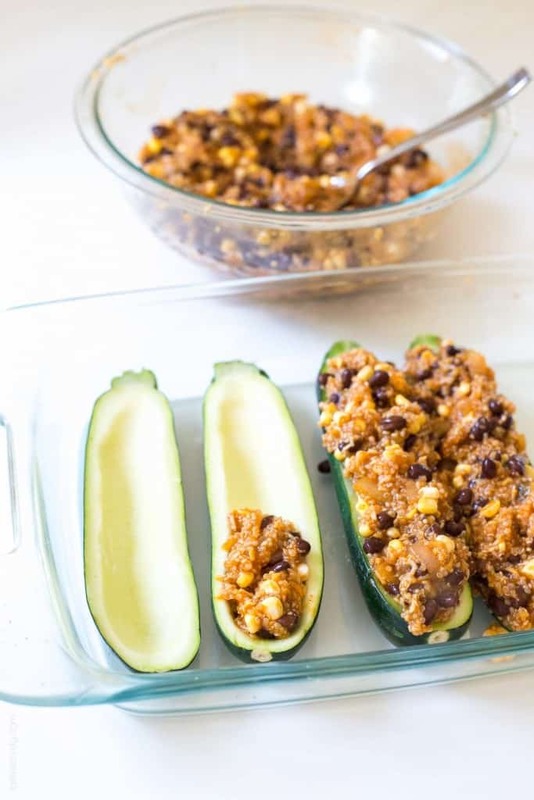 I just scooped out the zucchini’s, and made the delicious filling of cooked quinoa, onions, black beans, fresh corn, a little cheese and enchilada sauce. I stuffed them, put them in a disposable aluminum baking dish (the last thing a new mom wants is to do dishes and have to keep track of giving back baking dishes! ), and brought them over along with more cheese to top them before baking, an avocado and sour cream, and a healthy chopped mexican salad to serve on the side. Dinner was served! 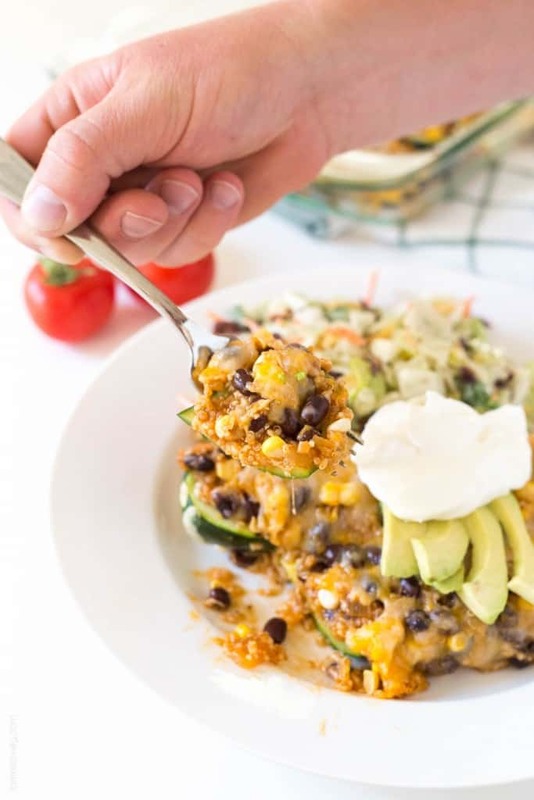 Our garden has given us so many great zucchini’s this summer, so I made this quinoa & black bean enchilada stuffed zucchini recipe multiple times for dinner. Was a great way to use them up. Even though there is no meat, you still get a nice serving of protein from the quinoa. And besides waiting for the quinoa to cook, this recipe takes just 10 minutes for me to throw together and pop in the oven. Perfect weeknight meal. Preheat your oven to 400 degrees with the tray in the middle rack. Preheat a medium size skillet over medium high heat. Cut the zucchini’s in half lengthwise, and scoop out the seeds with a melon baller or spoon. On a microwave safe plate or baking dish, microwave the scooped out zucchinis for 4 minutes over high heat, or until they are tender when pierced with a fork. Chop the zucchini seeds and flesh you scooped out, and cook it in the pan with the onion and olive oil. Season with a pinch of salt and pepper. Cook until all the water has evaporated from the zucchini, and the onion is translucent. About 6 minutes. Add in the garlic and cook 30 more seconds, then transfer the cooked zucchini and onion to a medium size bowl. 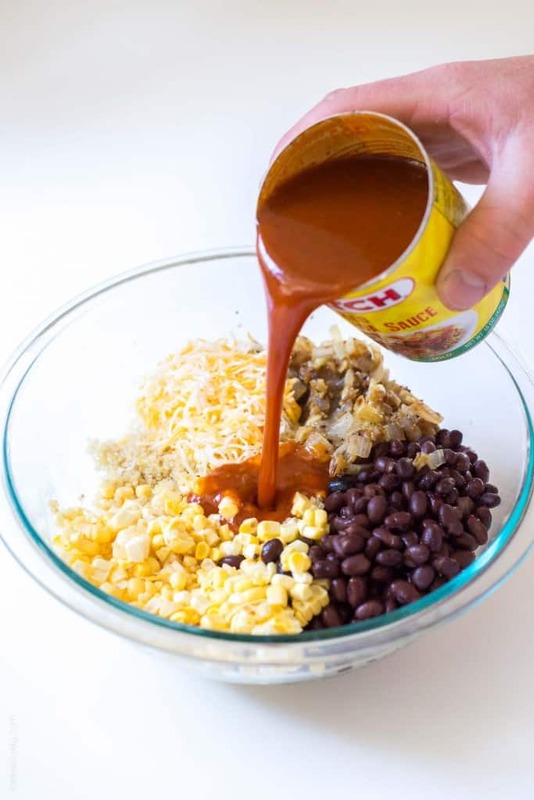 In the same medium size mixing bowl, combine the cooked zucchini and onion, cooked quinoa, black beans, corn, 1 cup shredded cheese, and about half the can of enchilada sauce. Stir to combine. You want the quinoa mixture to be evenly coated in the enchilada sauce, but not dripping or overly saturated. Transfer the microwaved zucchinis to an oven safe baking dish. Mine fit in a 9×13 baking dish, but you may need 2 depending on the size of your zucchinis. Season the microwaved zucchinis with a pinch of salt and pepper, then evenly distribute the quinoa mixture inside. Top with remaining 1 cup of shredded cheese. Bake uncovered for 10 minutes, or until the cheese has melted and the mixture is heated through. Serve warm with avocado slices and sour cream. Aww what a cute baby! Love that smile! And I’m sure your friend loved these stuffed zucchinis! I always have more laying around than I know what to do with, so I will have to try your enchilada version! Yum! These look absolutely wonderful! And perfect for the last few weeks of summer. Yum! Pinned :). What a handsome little dude! That is seriously so cool that you caught a smile on camera! And these zucchinis? Well, I WAS trying to figure out what to make for dinner tonight and I think the answer is staring me right in the face. I have all the ingredients to make these so it must be destiny! This zucchini looks SO awesome, Natalie! Oh it’s so good to have close friends in the know and how cute is her little one. His sweet face made me smile too :D . These boats, the zucchini!! Are you tired of it yet? I’m not, but Rob has protested more than once! I just keep making it! hehe…. Love all the flavors you’ve packed in here, Natalie. SO quick and easy to pull together too.. perfect for those hectic week nights. Thank you my dear!! OMG that little baby is ADORABLE! What a great shot Natalie! Congrats to your friend on her new baby and that’s so nice that she’s been able to help you out so much :) And, how thoughtful of you to make a dish like this for her. I love that you thought about making it full of veggies. I’m definitely going to steal a bunch of zucchini from my parent’s garden when I visit them this weekend. I can’t wait to try this! I can’t get over that smiling baby! I wish my baby was smiling in her bed right now. Lol. This is the perfect use for alllll those zucchini — love it! What an adorable baby! I tried taking my own newborn photos of Kai and it was pretty much a disaster, I guess food photography is my only specialty ;) And you are such a good friend to come bearing food! That is exactly what a new mom wants, nothing gets your appetite going like having a baby. 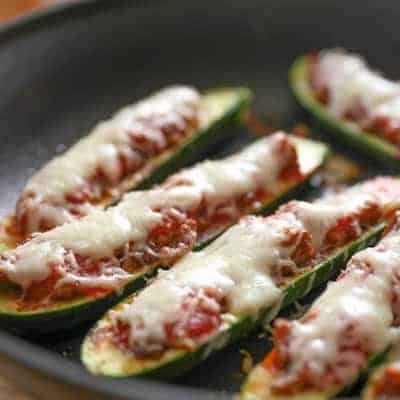 These stuffed zucchinis look delicious, hearty and healthy! Oh my gosh, how cute is that baby!? I’m sure yours will be just as adorable! :) These zucchini look soooo yummy. Everything about this dish is right up my alley!! Must make! Awww…that precious little baby! Such a sweet smile! 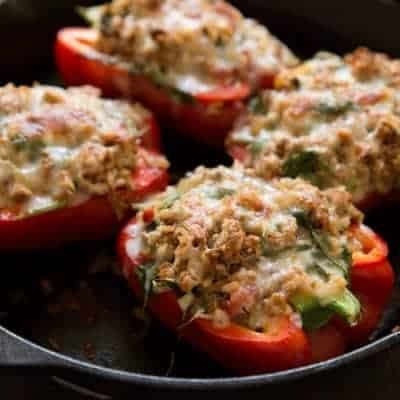 This dish looks delicious – I’ve been stuffing all the produce lately as well! Such a good summer meal! Ok, that newborn is the cutest! How is he already smiling?? Such great photos. I can’t wait for your little one’s photos :) And this quinoa boat! I keep meaning to make a stuffed zucchini but i keep just frying the zucchini instead. I’m determined now! 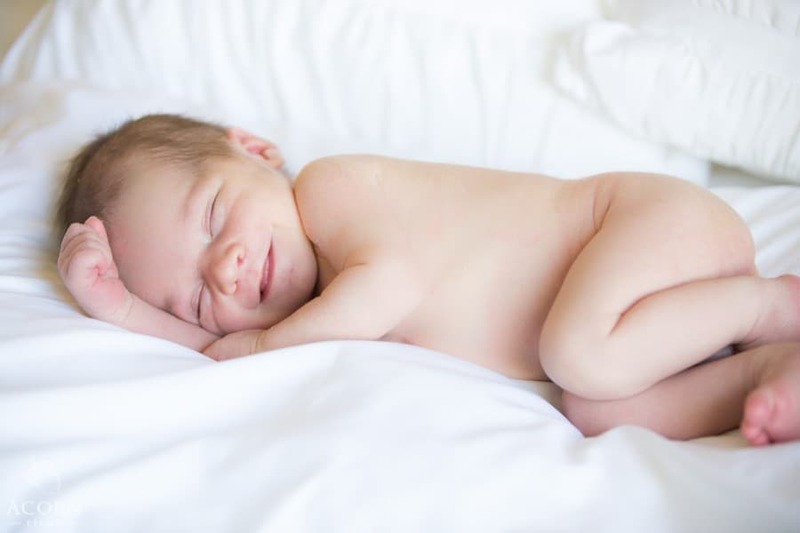 Oh my gosh, that newborn photo is too cute! I’m loving this stuffed zucchini too, such a fun way to use quinoa! Ahh that baby is so precious!! 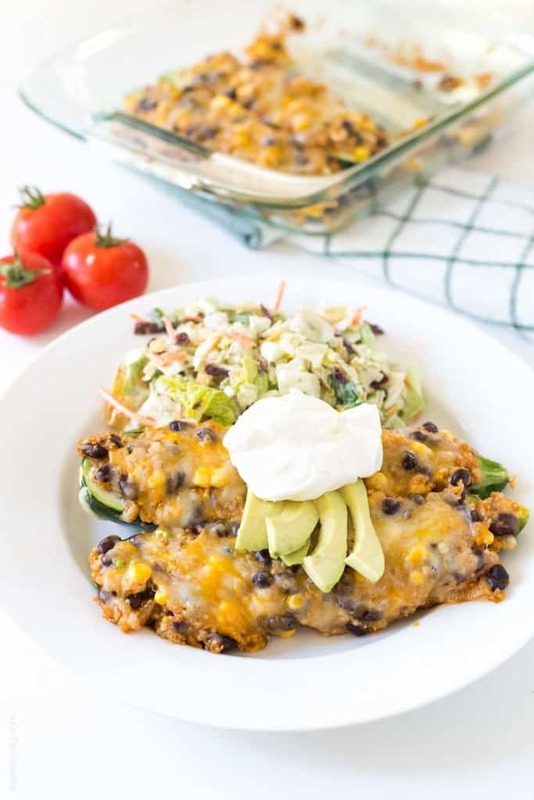 And these enchiladas look like an awesome weeknight meal! Have a wonderful long weekend. Yum!!! This healthier version of zucchinis looks amazing! He is so sweet!! What a little smile. These stuffed zucchinis feature so many favorite flavors, I need to make them ASAP! Nat, what a cute baby! I love that you caught his smile on camera! Thank you for the delicious recipe! My hub and I LOVED it. This would be a great make-ahead dish on crazy busy days! I am so happy to hear that! I love this dinner. It was such a great way to use up our zucchini this summer. I really appreciate you taking the time to let me know you liked my recipe. You just made my day! 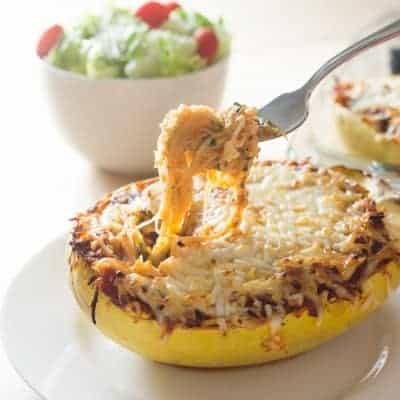 I cannot get enough of stuffed zucchini recipes! This recipe looks amazing and I am definitely trying this soon!! Thanks for sharing! Hope you liked it Kristine!